My least favorite book. It was such a relief to get back to Vlad after struggling with To Reign In Hell that I didn’t pay enough attention to what I was doing—I just wrote a straight-ahead story with nothing much else to it. That’s fine, in my opinion, if it’s a Really Good Story. But Yendi is only an okay story. I’d love to be able write this one over. 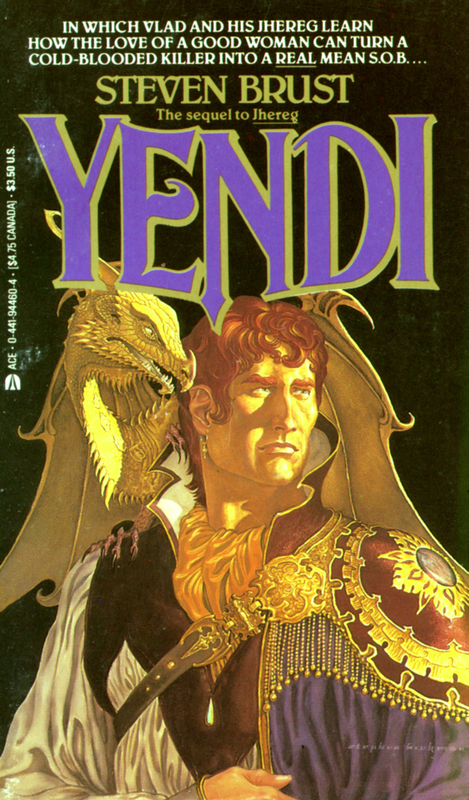 I hate to disagree with you, Good Sir, but Yendi is one of my top three favorite Vlad books. A good story, as you say, with layers of sub-plots so I never knew which ones would be significant in what ways (kinda like my life), outstandingly told. I was even more clueless of how this one would be resolved than I usually am with Vlad. On the other hand, I’d happily pay for a rewritten Yendi, should you wish to do so. It’s perfectly normal to have directors cuts of films so why not extend the idea to books? Also, have just discovered that the cruise I board in 9 days time has Texas Hold’em tables, and since it’s the sort of cruise which actually involves cruising, with the total of 2 stops between Mumbai and Piraeus, I shall be between the Devil and the Deep Blue Sea when it comes to playing poker. Stevie: I know it’s a little late, but: tight, aggressive play gets the money. In limit hold ’em, if you play only the top 10% of hands, play them strong, and just muck everything else, you’ll probably come out ahead. Not the best way to maximize profit, but it should win. I think all of the Vlad books are in my top 3 Vlad books. It is a sentiment with more heart than numerical accuracy, but it is at least sincere. BTW, I’m going to risk a minor constructive comment. I’m a bit old school when it comes to colorful language in books. I loved Hawk, but some of the allusions, while understated, were rather crude. I know it’s realistic in the sense of how people talk (including myself), but it’s a lot less fun than the extremely creative observations so common in your writing, and that I enjoy so much. In any case, I obsessively scan the internet for signs of your next book, so please, please, keep writing. It’s all scary good! I’ve been meaning to ask this for about 20 years but… well… why wasn’t Vlad drawn with a mustache? Couldn’t say. I wasn’t the artist. When you ask that the Devil not be blamed for things the Devil did not do, God’s most partisan advocates will ask why you’re defending the Devil. They cannot see that you’re defending Justice.